Other versions: PS3; XONE; X360; PC. 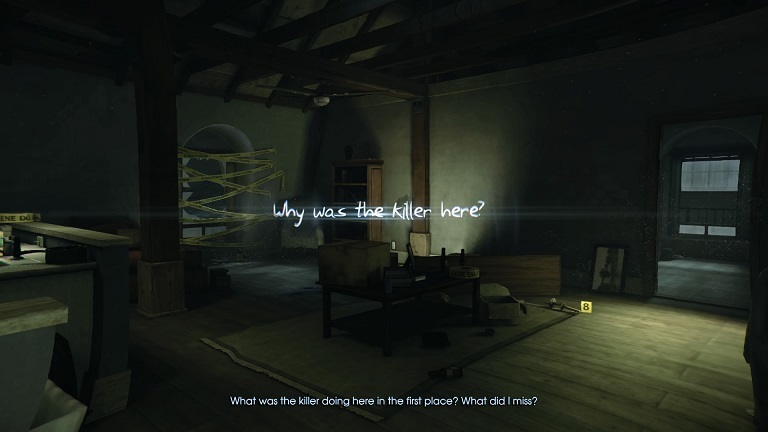 Ghosts are nothing new to games, but trying to solve your own murder certainly is. 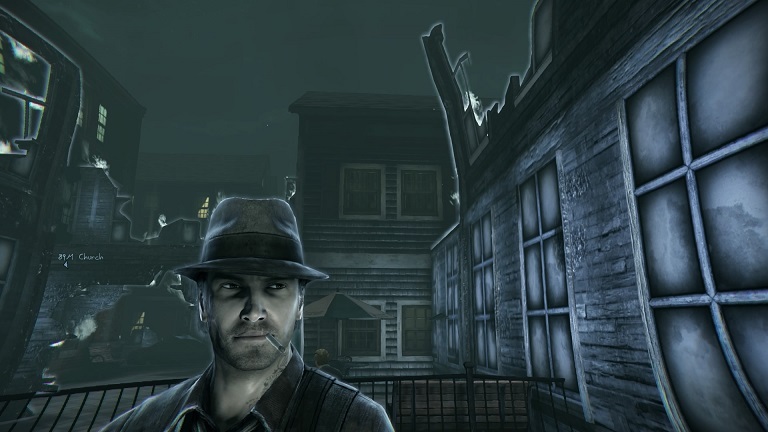 That’s the premise of Murdered: Soul Suspect, a new IP from Dark Void developers Airtight Games. The concept is really interesting, as the game mixes ghostly detective gameplay with the haunting and creepy atmosphere of Salem. But, similarly to Dark Void, it fails to make good on the interesting ideas. With shallow gameplay that becomes dull quickly, and a runtime which is at-best brisk, it ends up disappointing. As he is thrown out of a building’s window, Ronan O’Connor is tracking down the notorious Bell Killer. Unfortunately, this encounter culminates in his death, resulting in his transformation into a ghostly apparition with bullet holes aplenty. It is up to him, essentially, to solve his own murder by discovering the identity of this serial killer. It’s an intriguing premise, soaked with the tint of those cheesy 90s movies which tried to shove spirits in wherever possible. Its dark, absorbing atmosphere is heightened by the Salem setting, which complements the tone well. 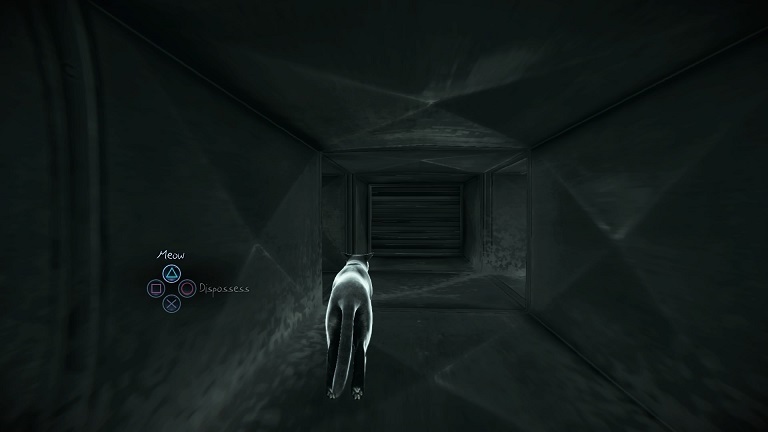 The mix of ghostly illusions and dark settings creates a feeling of unease, and it could have made the game really stand out. Unfortunately, while the style is there, the substance is not. At its core, it’s a light adventure mystery where you investigate an area for clues which, eventually, build to a conclusion. The problem is that the mystery-solving is so light, it becomes a bore. Clues are always in close proximity to each other, meaning you end up breezing through investigations without breaking a sweat. There are some instances where you must choose from evidence to determine the correct outcome, but these can be failed as often as you like, and without a scoring system in place to reward successful guesses, there’s no motivation for first-time deductions. It feels disappointing, becoming too linear and shallow to make for good adventure-game style investigations. But worse are the elements outside of investigation. When you’re not playing detective, you are using your ghostly abilities to navigate. These include possessing civilians, which then allows you to read their minds and even – at some points – influence them to do something, such as search for witnesses. It’s so scripted though, and whilst mind-reading is more prevalent, the responses are very canned. Ronan can also manipulate the environment, such as removing certain objects, teleporting and revealing objects. It can feel inconsistent though, as once again, it’s very specific to certain objects. The final component involves stealth mechanics, where you must clear a room of Demons by sneaking behind them and avoiding their line of sight. But there’s no actual way to sneak, and when multiple Demons appear, it becomes trial-and-error irritation. Murdered is also poor value for money. There’s no difficulty settings, meaning one playthrough is enough. 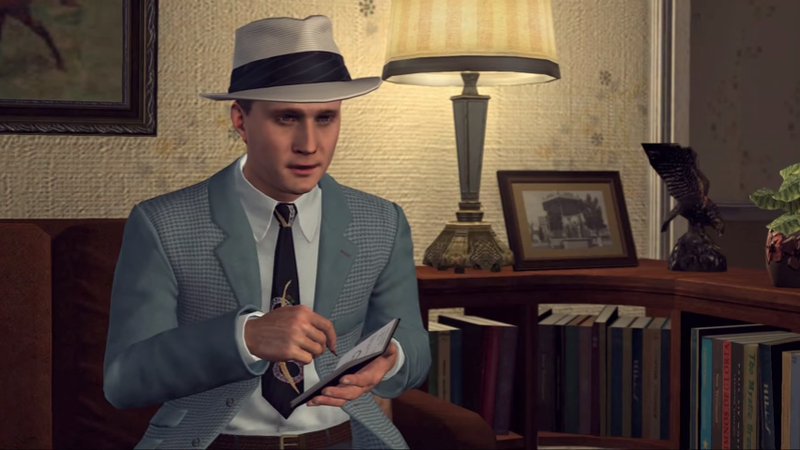 Hundreds of collectibles are spread throughout the game, and though they are worthwhile in terms of adding detail to the mystery, they are also very easy to find. The main story only takes six or seven hours to polish off, and unless you miss some collectibles on your first run, there’s very little reason to return. 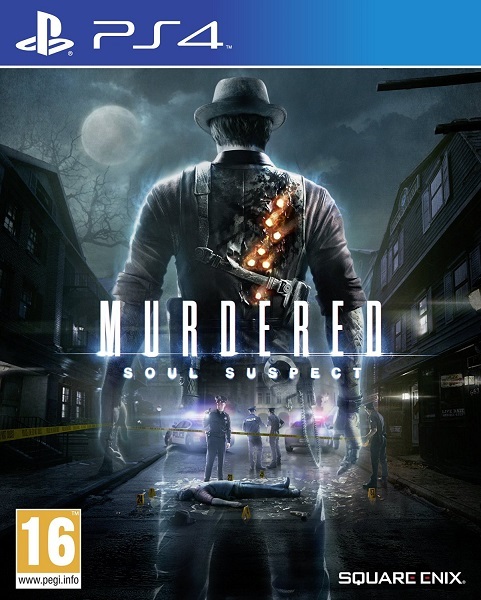 Considering Murdered was released at nearly £50 on PS4, buying it at launch would have been akin to burning your money. 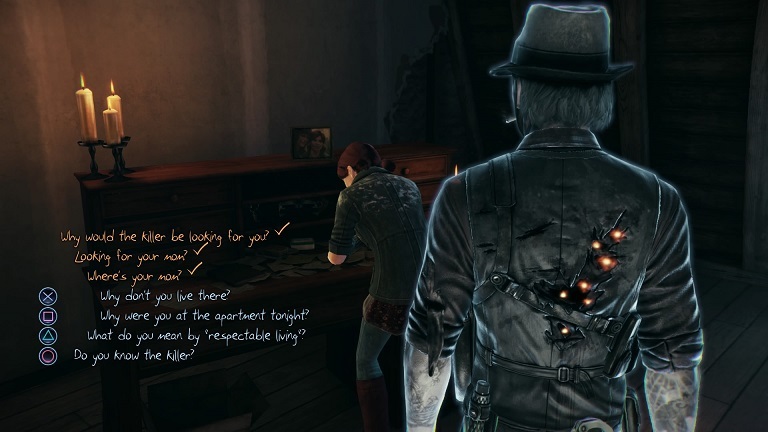 It’s a shame Soul Suspect’s separate elements fail to come together, as its presentation is impressive. Though not the most detailed game out there, the frame rate remains smooth and the animation during cut-scenes is very good. The fictionalised area of Salem feels eerie, creepy and dark, making for a great murder-mystery setting. The audio is pretty good too. Though Ronan’s acting can be rather dull at times, it’s the supporting cast which pick up the slack, echoing the aforementioned cheesy vibe of 90s ghost movies. The music is light and atmospheric, with spooky silence often utilised to creating tension. And the ghostly sounds all fit well. 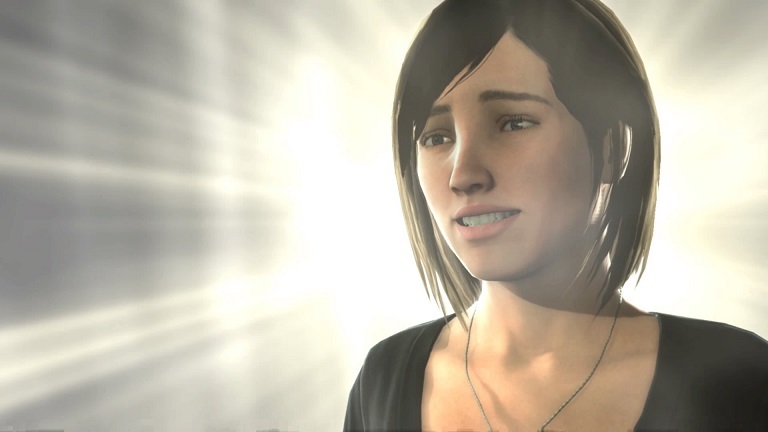 It’s a pity that care wasn’t given to the gameplay like the presentation. 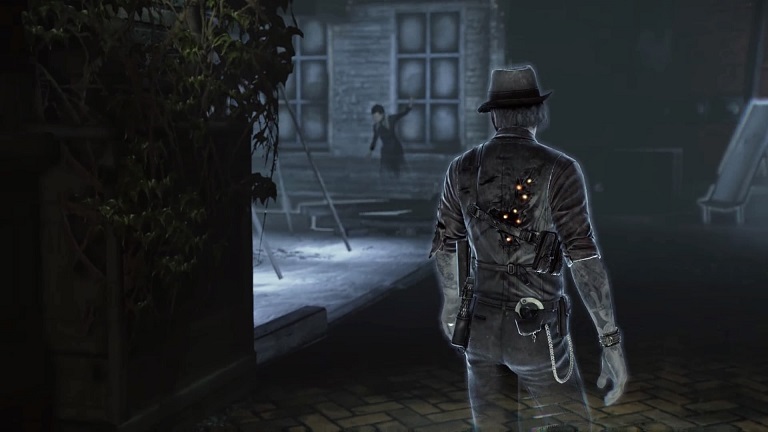 Murdered: Soul Suspect is an unfortunate disappointment. It could have been one of the coolest adventures in recent memory, and its unique setting and story still deserve praise. But while the presentation is pleasing, it’s gameplay is shallow, repetitive and unsatisfying, and as it falls shy of the ten hour mark, it’s also questionable value for money. In the end, if you’re intrigued by the ghostly concept, its style and unique attributes mean that it’s worth a go, on the cheap. But anyone paying more than a tenner will feel ripped off.